At the age of three, Eileen Cronin first realized that only she did not have legs. Her boisterous Catholic family accepted her situation as “God’s will,” treating her no differently than her ten siblings, as she “squiddled” through their 1960s Cincinnati home. But starting school, even wearing prosthetics, Cronin had to brave bullying and embarrassing questions. Thanks to her older brother’s coaching, she handled a classmate’s playground taunts with a smack from her lunchbox. As a teen, thrilled when boys asked her out, she was confused about what sexuality meant for her. 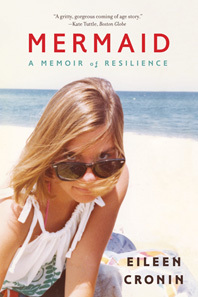 She felt most comfortable and happiest relaxing and skinny dipping with her girlfriends, imagining herself “an elusive mermaid.” The cause of her disability remained taboo, however, even as she looked toward the future and the possibility of her own family. In later years, as her mother battled mental illness and denied having taken the drug thalidomide—known to cause birth defects—Cronin felt apart from her family. After the death of a close brother, she turned to alcohol. Eventually, however, she found the strength to set out on her own, volunteering at hospitals and earning a PhD in clinical psychology.